Harry Kane stunned Arsenal with a brace in a captivating North London Derby to ignite White Hart Lane and give the Spurs some well-deserved bragging rights. Mesut Özil capped off a pulsating opening to the game with his side-footed attempt to beat Lloris after Giroud's shot was deflected, but as Tottenham continued to feed of the crowd and rise to the occasion, Harry Kane would once more nail his name into the scoresheet pouncing on Ospina's parry. But, as the time winded down in noisy North London, Harry Kane buried a powerful header to spark jubilation among the Tottenham supporters, going on to win the North London derby. Tottenham initiated the frantic start from left to right, and it was end-to-end stuff from the outset. The Gunners defence looked rather permeable to start, stagnated as Harry Kane charged forward. The soaring Englishman—who has scored 21 goals in all competitions this season—managed to cut in to his dangerous right foot, curling into the bottom right corner from outside the area. David Ospina got finger-tips to the ball to thwart the first deadly attempt of the game. It came at a cost though, as the Colombian appeared to be nursing an injury subsequently after, he was however good to play on. While they couldn't find their feet for the opening few minutes, Arsenal would lethally strike when given the chance. Mesut Özil continued his impressive resurgence by adding another goal to his collection, side-footing the ball into the net. Danny Welbeck won the plaudits as he waltzed down the wing at incredible pace to find Giroud. The Frenchman's shot was deflected onto the path of Özil who was ready to pounce on the opportunity, side-footing into goal. That goal would hardly rupture the equilibrium of the contest. Tottenham looked to strike back viciously but Danny Rose conjured up a left-footed drilled attempt at goal only to be cautiously collected by an alert David Ospina. White Hart Lane was pushed on the verge of mayhem as Arsenal strongly thought they deserved a penalty. Ryan Mason appeared tentative in the defensive area, and handled the ball—as replays clearly showed. Referee Martin Atkinson however saw nothing of it, and Arsenal' lead remained at one goal. Arsene Wenger's men were struggling to find some consistent shape at the back, with Bentaleb managing to get a look on goal only for his shot to drift wide. Danny Rose then continued his bright start to the match as he blitzed into the box with a tame effort to end it. The visitors' Colombian shot-stopper would be forced into action once more, as Ryan Mason—who continued to rack up the yardage across all areas of the pitch—let fly with a long-range attempt which the South American pounced up high to force a corner kick. Showing great character and desire, Tottenham had tilted the game into their favour, barring the scoreline. Christian Eriksen possessed much danger from his numerous free-kick attempts. The first was rushed out by a concerned defender, and the other fell in the hands of a grateful David Ospina. As a very competitive first half drew to a close, Arsenal kept ahead as the first half drew to a close, there was some commotion with Danny Welbeck and Danny Rose, but seeing as it was another heated derby moment, it eventually phased out. Santi Cazorla almost pushed the game out of the reach with the first threatening attempt of the second half. The Spaniard looked to find the bottom right corner, only for Hugo Lloris to tip the ball away. That would prove a mere glimpse in the whole spectrum of things, as Tottenham once again forced the game back into their style. Koscielny was booked for a foul on Dembele, before Ryan Mason once again troubled, this time winning a corner kick for Spurs. 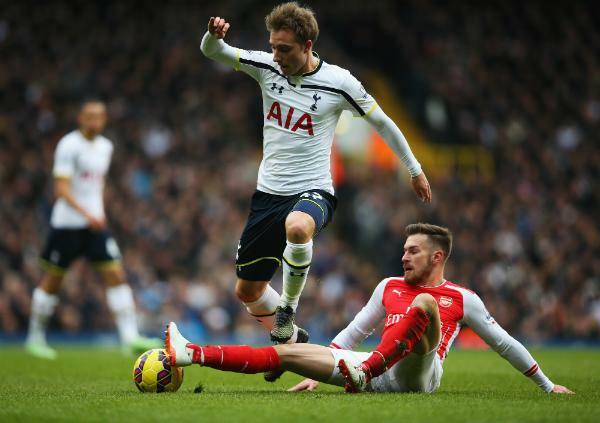 Christian Eriksen floated in a menacing ball, where it was flicked on towards goal. The keeper David Ospina managed to get a touch on it, but it would fall into the lethal path of Harry Kane who finished reliably, with a powerful first-time shot into the bottom corner. White Hart Lane was rocking and passions were ignited as the forward got his 22nd goal of the season. With the atmosphere now upped, and everything falling into the hosts' hands, the Arsenal box was under siege. Ospina parried out, the centre-halves cleared hesitantly, but Arsenal were facing an uphill battle with Tottenham out-playing them as the hour-mark approached. Danny Welbeck's great effort from a throw-in though was an ever-so-stern reminder of how Arsenal could shift the game. The then-playing winger curled in to creep the ball past Lloris, but he forced a corner. In the subsequent corner, Koscielny caught a free-header, but it was straight at the Spurs captain for the save. David Ospina produced some marvellous heroics to stop the soaring home side from taking the lead. Bentaleb managed to turn and drill the ball towards the bottom right corner, but as Ospina parried it out to Harry Kane, he couldn't find the net. It was offside anyway. Christian Eriksen failed to convert a free-kick from his range of 20-25 yards, as the game moved into a more even flow. 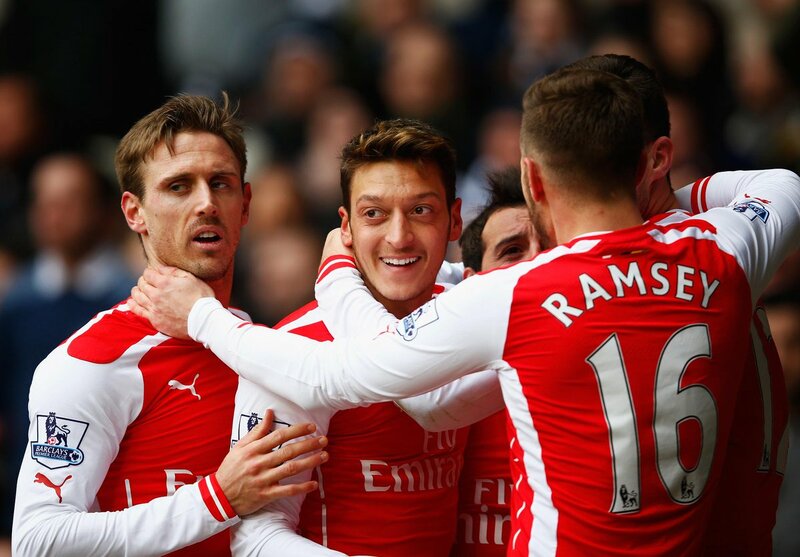 The North London Derby was possessing heaps of riveting intensity. Erik Lamela missed a gaping opportunity to smash Spurs ahead following Eriksen's cut-back. Instead of leaving it, the Argentine decided to attempt the optimistic volley on the turn. With 10-minutes remaining of regulation, all was to play for. As Arsenal dropped back slightly, the scenes in North London would escalate to pure euphoria, as Harry Kane scored his second to give Spurs the lead. Nabil Bentaleb delivered in a light cross, of which Kane guided in with a powerful, accurate header. Keeping his eyes on the ball at all times, it was some textbook work by Spurs' hitman to give them the bragging rights in the derby. Tottenham would then be forced to defend within the magical atmosphere reverberating around the stadium. Arsenal would do all they could, but nothing seemed to work as stoppage time approached. Nacho Monreal's shot was blocked out for a corner kick of which came to no threat. The full-time whistle would blow, marking a time for celebrations for all affiliated with Tottenham Hotspur football club. A fantastic game of football to open week twenty-four of the season. Santi Cazorla's disappearing act definitely cost Arsenal considering that the presence of the Spaniard can do so much to help them in an attacking presence. Christian Eriksen proved a fantastic catalyst to create the many chances he did, but it all came down to Harry Kane, he is proving to be a superb talent and defying any boundaries that may have been set to him. This is a massive win for Spurs in the race for a top-four spot, while it's a definite spanner in the works for Arsenal who were really beginning to look good. Harry Kane continues to flourish for Tottenham—he once again comes up with the goods, this time to give his sides the renowned bragging rights in North London. 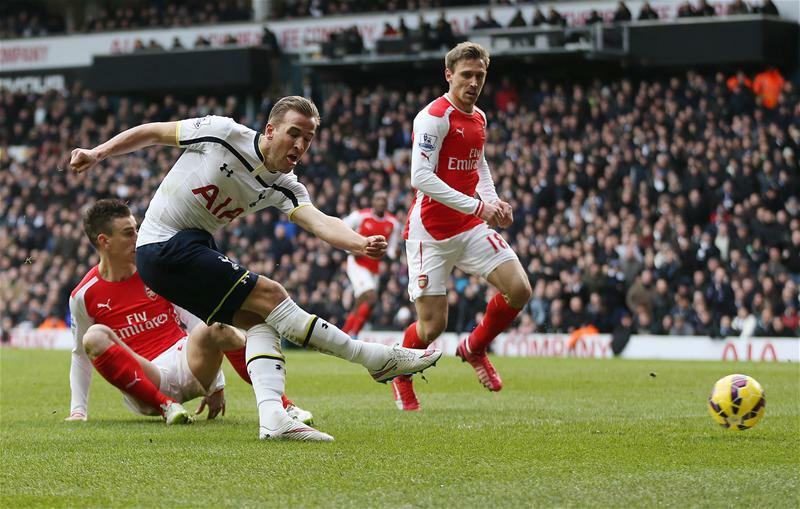 Harry Kane's brace lifts Tottenham over Arsenal in a captivating North London Derby.